Essential Oils. THIS MUST BE DEALT WITH NOW. Sounding THE ALARM In JESUS NAME! Witchcraft is far more common than people realize. Sister Beth Eckert was called and blessed by The LORD to do an amazing job in explaining all about it and how witchcraft affects our daily lives in this YouTube video below. This is an excellent resource to bookmark and share with your loved ones. I personally assure you today that this is a real EYE OPENER! Christians NEED TO BE AWARE and NOT IGNORANT of Satan’s Devices! His list has gotten longer! In this day and age the demonic has infiltrated everything. We must be vigilant! God says His People perish for lack of knowledge! Educate yourself and others! I am blessed with the freedoms that I have as an American to sound the alarm and blow the whistle on this stuff in The Name of The LORD! I will do so as long as I can in JESUS NAME for The GLORY of GOD who has SET ME FREE FROM MUCH! I really admire the boldness of a very anointed Pastor out of Knoxville, Tennessee who faithfully exposes the works of darkness on Sundays at Temple Baptist Church where he’s preached at for years. God led me to his YouTube channel a few years back and I was blown away at the powerful messages that I found for my loved ones and I to enjoy. I was fortunate enough to have actually met Pastor Charles Lawson himself twice as I attended church there on two separate accounts in Knoxville with my ex husband. It was such a blessing for me to be in the midst of a Holy Spirit led service. I am coming out of a lifetime of religion so I truly savor and cherish The Anointing of The Precious Spirit of Liberty! The Presence of The LORD was surely there in that little Tennessee church. He touched me both times I was there. God is FAITHFUL no matter what season you are in! I refuse to sit back and watch Satan deceive the world with these Essential Oils. I have been spared from too much myself and if I did NOTHING about this the blood would be ON MY HANDS as in Ezekiel 33. I took this picture of an Essential Oils package with my phone while at Walmart. These are obviously manufactured by another company but it’s all got the same scheme in mind. Influencing the people through EVIL/witchcraft and oils. Harnessing POWER = WITCHCRAFT people! HELLO!?!? This has gone under the radar a lot with a sleeping church and a world consumed in darkness. We MUST TAKE A STAND TODAY! What will you do? I encourage you to not be silent or remain idle. The information is in your hands now. You have been warned. I honestly have not done much research yet about the New Age infiltration of The Church but it is a real problem because I haven’t had to dig to notice this issue! Marie Gunther, Guest and Program director for the radio broadcast, The Power Hour, is a Young Living Essential Oils Independent Distributor. Marie signs up Power Hour website visitors and others to sell under her in Gary’s Young’s multi-level marketing company that has a spiritual agenda. Gary Young’s Young Living Essential Oils company attributes spiritual properties to many of their products. Below are a few examples of spiritual claims they make for their products. The descriptions indicate that their essential oils have the power to do things of a spiritual nature. My explanations of occult terms used by Young Living Essential Oils are in italics. Dream Catcher “may be useful during meditation” and “enhance dreams and visualization;” (2) Meditation and visualization are practiced by witches and other occultists in order to contact the (evil) spirit world. Jasmine “has been used throughout history for romance and attraction and for balancing the feminine energy of the body.” (4) “Feminine energy” is a witchcraft term. Valor “. . . It has also been found to help energy alignment in the body.” (7) “Energy alignment” is yet another term right out of witchcraft. The Phoenix Bird is a Symbol for Lucifer. A close look at my hard copy of a 2004/2005 edition of a Young Living Essential Oils Product Guide reveals that the Young Living Essential Oils company has a spiritual agenda for those who are a part of their business network (MLM) and all who buy and use their products. The Young Living 2004/2005 Product Guide’s Business Building Kit section has a page that is marked with a symbol that stands for Lucifer: a Phoenix bird! This Phoenix Bird symbol marks the cover of the “Phoenix Life and Training” Leadership Seminar Album CD which is in on page 77 of the Product Guide. (Also notice another Luciferian symbol in the design: a sunburst.) The same Product Guide also features a sunburst marking on the cover of a DVD set called, Gary Young’s Raindrop Technique: The Beautiful Art of Restoring Balance. Gary’s Raindrop Technique stems from the “energy techniques” of the Lakota Indians. The use of the “Phoenix” wording and symbolism marks what Young Living refers to as “the most powerful business tool in the network marketing industry” for Lucifer. The descriptions of many of their products and the blatant witchcraft teachings on the Young Living blog further support this observation. While you examine the pdf of page 77 of the 2004/2005 Young Living Product Guide, take note of the label on the essential oil called Transformation. The Transformation oil label is marked with the same Phoenix bird/sunburst design. I find that working with essential oils and the five basic elements (earth, water, fire, air, and ether) are wonderful and effective ways to cultivate and balance energy. The five elements represent the rawest form of basic energy types that we all have. Through movement, using essential oils, and consciously running our energy, we can significantly boost our energy and bring harmony to mind, body, and spirit. The phrases, “five basic elements,” “balance energy,” and “running our energy” are witchcraft terms. “Setting Your Personal Vibration for 2012”- How are we running our Energy these days? What IS Vibration and how will it help us as we draw close to the end of an Era? What do we need to do as Human Beings to change the way we interact with Life itself? Note: “Running our energy” is a witch euphemism for directing demons to do their bidding. Akasha meaning pure spirit, is the fifth element. It is the subtle spiritual essence that pervades all space. It is not ether itself, but is an ether-like substance of a spiritual rather than material nature. Another worthy point is the influence that have on our frequency as well. Negative thoughts lowered the measured frequency by 12 MHz and positive thoughts raised the measured frequency by 10 MHz. It was also found that prayer and meditation increased the measured frequency levels by 15 MHz. Radionic diagnosis and treatment are not medical procedures, but are rather of a quantum, esoteric, or spiritual nature, tapping into dimensions that are beyond the Physical Plane. It is in these higher dimensions that the origins of all experiences in the Physical Plane are thought to originate. Those who serve the Lord Jesus Christ rather than their own lusts must remember that one cannot serve both God and mammon (money). God is light. He is not a mixture of light and darkness. A genuine child of God cannot drink from the Lord’s cup and the cup of devils. God’s people cannot not partake of the Lord’s table and the table of devils. Important: Liberty To The Captives is not attacking the use of oils, herbs, and other natural aids to healing. We agree that natural healing remedies are best and we like to use essential oils. We are warning against buying oils from companies that mark themselves for witchcraft. There is, of course, a difference between the natural and the supernatural. Scriptures warns Christians to not be ignorant of Satan’s devices. One of his devices is to lure Christians into yoking with companies who promote occult supernatural healing methodologies and in other ways mark themselves for the occult, such as Young Living Essential Oils. How do you make sure you don’t cross the line into yoking with what Scripture reveals God opposes? By not promoting or yoking with companies who plainly advocate Satan’s devices. Young Living does exactly that by choosing witchcraft terms to describe their products and by pushing occult methodologies such as energy healing, which is demonic healing. God’s people must be holy and separate and refuse to yoke with occult-marked companies in order to earn money. The Bible says the love of money is the root of all evil. Christians must be abstain from all appearance of evil and avoid yoking with companies that mark themselves for witchcraft. Oils, soap, etc. are good to be used and sold as long as they are not produced by companies who reveal by their own words that they are into the occult. URLs are posted for the purpose of documentation only. Several people have written to me within the last few months to express concern about a possible connection between essential oils and the occult. The information I have uncovered, including how these oils are “blessed”, is indeed disturbing. 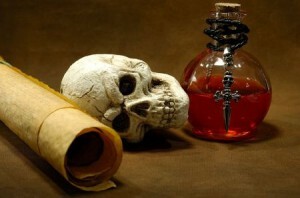 First of all, let me extend many thanks to The Last Hiker blog which published a spectacular expose on the connection between essential oil “blends” and witchcraft last June. This blog also exposes the very New Age mindset of Gary Young, the controversial founder of Young Living Essential Oils. The author of this blog was candid enough to reveal that she was once a dabbler in the occult and is aware of the way oils are used in various Wiccan and pagan practices. She explains that the Greek word for sorcery is pharmakeia, which refers to medicines or drugs that are combined to accomplish some kind of physical or spiritual intention. This becomes what is known as a potion. In witchcraft, potions are used for a variety of reasons. For example, this recipe for a potion called “Earth”, combines myrrh, rose, patchouli and vetiver oils and is designed to bring prosperity and protection. The “Water” potion, which combines bergamot, jasmine and myrrh, is created to bring psychic ability, sensuality and to increase emotions. Now listen to the way Young Living describes a blend known as “Abundance”, which is a mixture of Orange, Clove, Cinnamon Bark, Frankincense, Ginger, Spruce, Patchouli, and Myrrh. So what’s the difference between what witches have been doing for centuries – and what many of these essential oil producers are doing now? This certainly confirms what several priests have warned us about – that many of these oils are “blessed” at the point of manufacture. We can only wonder how widespread is this “blessing” of oils and if any other rituals are used to “purpose” particular blends. Glory to GOD IN JESUS NAME! I believe what little I have shared here today is enough evidence for us. It is my prayer that The Holy Spirit will open the eyes of all who see this article to understand the reality of Essential Oils and what’s going on in the world today. I pray this will help people and make a difference for God’s Kingdom. God bless you abundantly in Jesus Name. Thanks for reading. Previous postGrowing Your Prayer Life. Understanding Different Types of Prayer. Essential Oils are good to help alleviate symptoms and are not cures. Natural Healing can cure if the God/Dvine are in agreement about this. Definitely the Essential Oils can be used for good or evil depending on how they are administered and who produces them like you say Young Oils use evil symbolism on their products. These should be avoided. Evil healing methods such as Reiki are initiated with evil spirits and can only be harmful often they bind the person so they neither become healed or worse. There is too much evil witchcraft around these days and something has to be done to stop it. One of the most powerful forms of Natural Healing I know is the Power of Prayer through God/Divine then again it is with permission of God/Divine. Great article and I am pleased to have seen it here on WordPress.